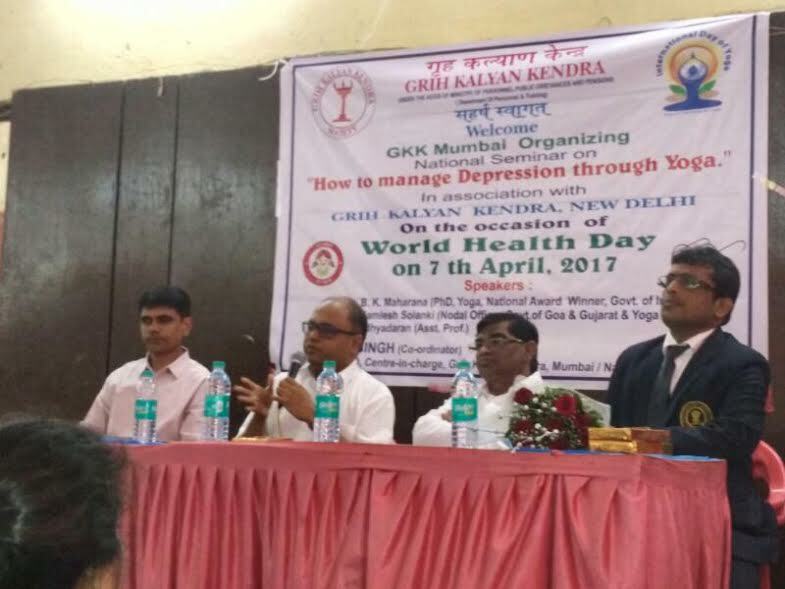 Mumbai : On the occasion of ‘World Health Day’ Grih Kalyan Kendra, Mumbai has organized a National Seminar, “How to Manage Depression through Yoga”, at Samaj Sadan Hall, Antophill, Mumbai in association with Grih Kalyan Kendra, (Dept. of Personnel and Training, Govt. of India, New Delhi under the guidance of J. M. Singh, Area Welfare Officer & Centre-in-charge, GKK, Mumbai/ Navi Mumbai in the state of Maharashtra. Prof. Vidhiyadharan Nadarajah, speaker of the seminar, told, we can able to control our depressions through creating peace and happiness in mind which is possible only through the regular practice of Yoga. Dr. Kamlesh Solanki, nodal officer, Govt. of Goa & Gujurat, told, now a days, Yoga is very essential and the only right path, each and every individual should find minimum 30 minutes everyday towards their body, mind and soul to manage depression. Dr. Gaurav Khare, Siddharth Muincipal Hospital, Goregaon, Mumbai and team helped a lot for the mobile blood donation camp, organized by GKK, Mumbai and many students of Yoga also donated their blood voluntarily. All Yoga students, teachers of Grih Kalyan Kendra School along with Sumitra Maharana,Yoga Teacher, GKK, Mumbai has arranged Yoga foods & green tea for all participants during the occasion to make the program a grand success.